After I read The Wicked City by Beatriz Williams I knew that I would want to read more by the author. When TLC Book Tours offered to send me her latest, Cocoa Beach at no charge I happily accepted. Ms. Williams’s book, A Certain Age tells the tale of Sophie Fortescue. 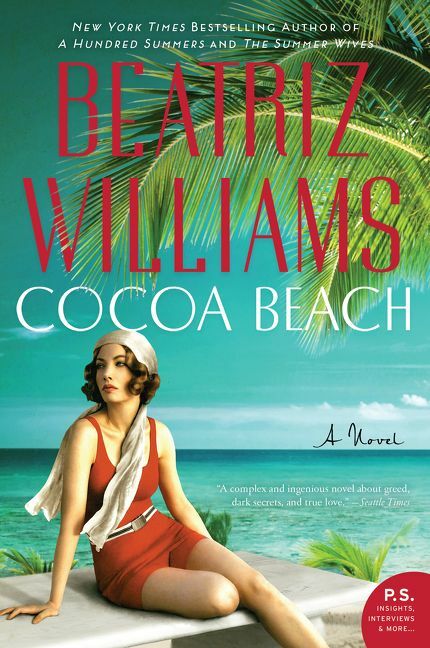 Cocoa Beach is, no pun intended, the sister book as it shares Virginia Fortescue’s story. These two young women are very different and so are the books that describe them. Virginia has gone to war to drive ambulances for the American Red Cross. While doing that she meets Simon Fitzwilliam – a British doctor – and they slowly develop a relationship that ends in marriage. But for whatever reason Virginia leaves England alone without telling Simon she is pregnant. She settles back in NY and rears her daughter, Evelyn while dealing with some extreme family drama. Upon the completion of a trial she learns that Simon is dead and that he’s left his estate to her. To sort it all out and perhaps for a change of scenery Virginia and Evelyn head to Florida to learn what they can about Simon’s death and about the business he left behind. While in Florida she encounters her brother in law and sister in law but she is not sure whom she can trust. She learns from a Revenue Agent that Simon was helping to fight a local gang and that might have contributed to his death. The more she learns, the more confused she becomes. The book toggles back and forth in time and place between Virginia’s adventures in France and England during the War and her present day life as she goes to Florida in search of answers. The chapters written in Europe were tighter, cleaner and much more clear. The chapters in Florida were not as clear. In fact, like the feeling Virginia has when she is concussed, they are rather confused. In my opinion the ending could have been achieved without some of the sturm und drang. Virginia spent a little too much time in her head. But that is me – others might feel differently. I did read the book in one sitting and there were a couple of big twists and turns that kept the story very interesting. One is a real whopper. It almost made up for the extended trip to the plantation. Virginia is a very conflicting character seemingly strong but then weak as a kitten but when necessary she pulls it all together. It confused me as a reader. The other characters were defined and not so changeable. What the book comes down to ultimately is love and trust and the impacts of these on family dynamics.